Comedy horror is a tricky thing to get right. Once the writer has set out their stall with a couple of rib-ticklers they will often reach a crossroads: to continue with the comedy, or to continue with the horror. Go along one route and they get something like Army of Darkness: an enormously entertaining romp, yes, but one that can hardly be called horror. Go along the other route and they get something like The Frighteners: still entertaining, but the rapid change in tone makes for an uneven experience. John Dies At The End, for me, errs towards the latter of these. 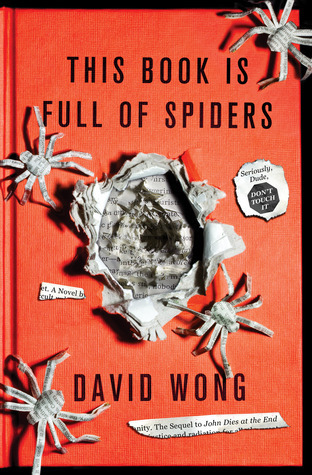 After a rollercoaster ride of ickyness and about a thousand Roswells’ worth of utterly barking scenes, Wong (or Pargin, if you prefer) tries to inject some heart into the story to give the ensuing drama more oomph and, in doing so, leaves the reader wondering where the laughs went. There are a few other niggles too, such as how some incidental characters drift out of the story leaving you to wonder why they were there in the first place, or are brought into the story and then criminally underused. Also, while not explaining everything is by no means A Bad Thing you are left mulling over some scenes and wondering if they were just thrown in there to keep the wackiness up. So far, you may say, so negative. So why the four stars? Well, despite its faults, as it turns out I rather liked The Frighteners, and in John Dies At The End I can forgive much of the above in exchange for the genuine belly laughs, the excellent dialogue, the vivid imagery and effective metaphors the guy chucks onto the page, and that’s even before we get to the truckload of imagination that went into knitting together one of the most wilfully odd stories I’ve read in ages. I’m keen to see the movie, partly because I loved Don Coscarelli’s Bubba Ho-Tep, but mostly to see if they can pull it off, and already have the follow-up beside me ready to crack open once I’ve posted this. In short, I liked this a lot, but I can see how it may grate on others. This might be one to read the first however-many-pages on Amazon beforehand.